Cirsium arvense roots. Karl Foord. University of Minnesota Extention. extention.umn.edu (Accessed 1/2018). 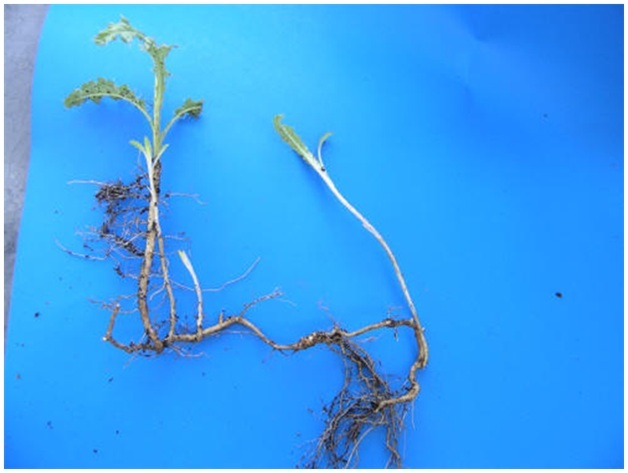 Cirsium arvense is a perennial herb, 30-150 cm tall, leafy, spiny, aggressively colonial from deep, creeping roots, root depths of over 6 m reported, can regenerate from root segments, however individual roots only live for about 2 years; horizontal roots may grow 6 m per season, emerges in mid-April, minimum root reserves occur in June, just before flowering, but increase rapidly in Sept.-Oct..
Cirsium arvense leaf. Glen Mittelhauser. Copyright © 2015 Glen Mittelhauser.New England wild Flower Society.gobotany.newenglandwild.org (Accessed 12/2014). Leaves alternate, pinnately lobed, margin very spiny, often white wooly below, upper leaves sessile. 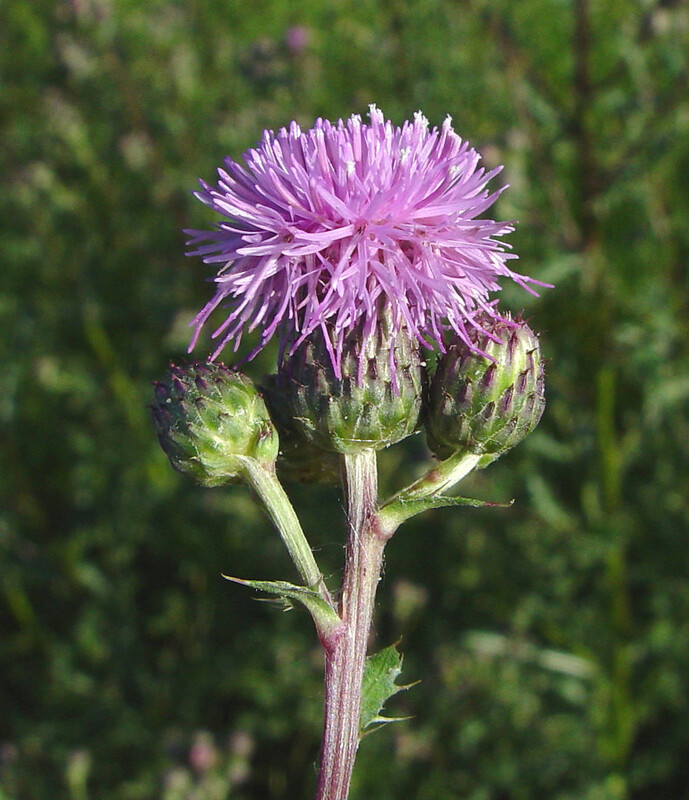 Cirsium arvense flower head. Arthur Haines. Copyright © 2015.New England Wild flower Society. gobotany.newenglandwild.org (Accessed 2/2015). Flowers purple, sometimes white, imperfectly dioecious, radially symmetrical, tubular, to 2.6 cm long, males shorter, no rays, heads small, numerous, bracteate base of head to 2.5 cm high, male heads rounded, smaller than flask-shaped female heads. Cirsium arvense in fruit. 2004 © Peter M. Dziuk. Minnesota Wildflowers. minnesotawildflowers.info (Accessed 1/2018). 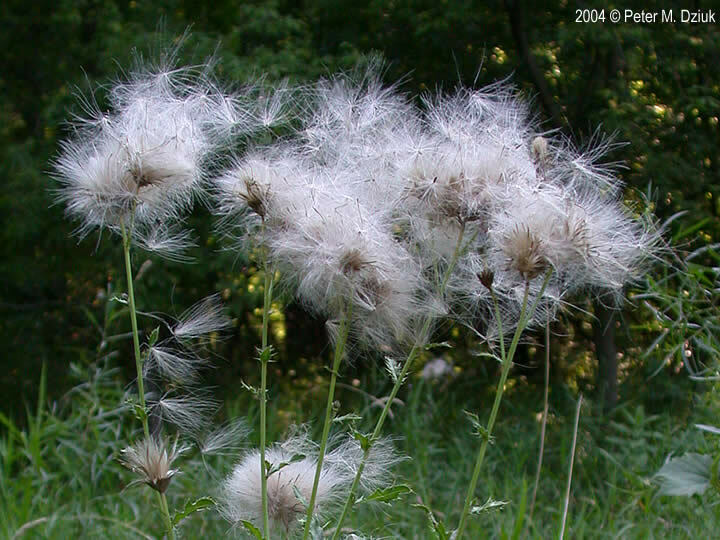 Fruit dry, 1-seeded, white-plumed, dispersed by wind or rainwater. Seed production generally requires clones of both sexes within about 300 m of one another (Sather 1995a). Seeds eaten by Goldfinches (Martin et al. 1951). Circium arvense fruit (plumed achene). © 2007 Gary Fewless. Herbarium, Cofrin Center for Biodiversity. U. Wisconsin at Green Bay. Invasive Plants of wisconsin. uwgb.edu (Accessed 1/2018). Habitat: Open areas, fields, roadsides, fill. Intolerant of shade. Tolerant of a wide variety of soil types and moisture regimes (Nuzzo 2000). Notes: Attacked by Larvae of Cynthia cardui, the painted lady butterfly which can defoliate Canada thistle. 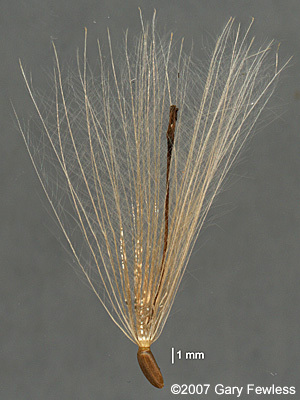 Seeds damaged by larvae of Dasyneura gibsoni, the Canada thistle midge. Flower heads damaged by larvae of the fly Orellia ruficauda. Canada thistle is attacked by as many as 100 other species of insects, including members of the orders: Orthoptera (grasshoppers), Thysanoptera (thrips), Hemiptera (true bugs), Homoptera (leaf hoppers, aphids, scale), Coleoptera (beetles, Lepidoptera (moths and butterflies), and Diptera (flies). 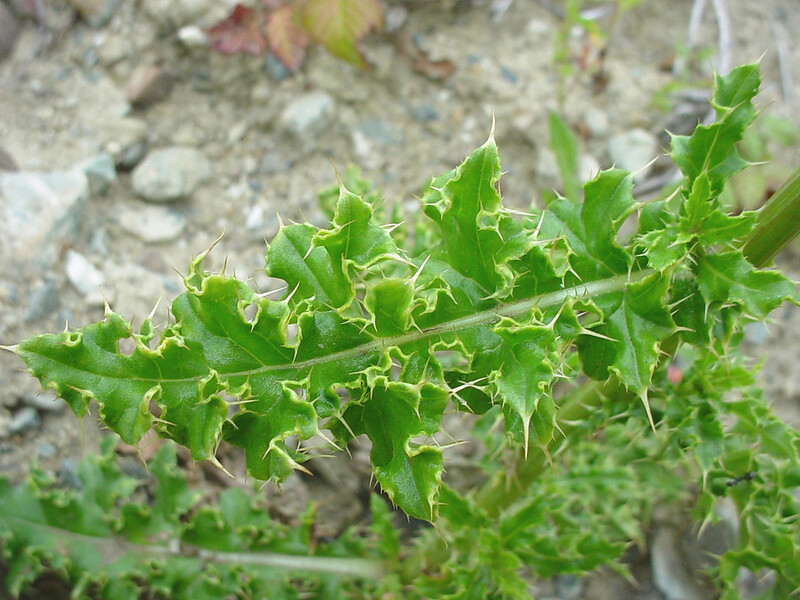 Canada thistle is also host to a number of fungi, and the Aster yellows virus, (Moore 1975). 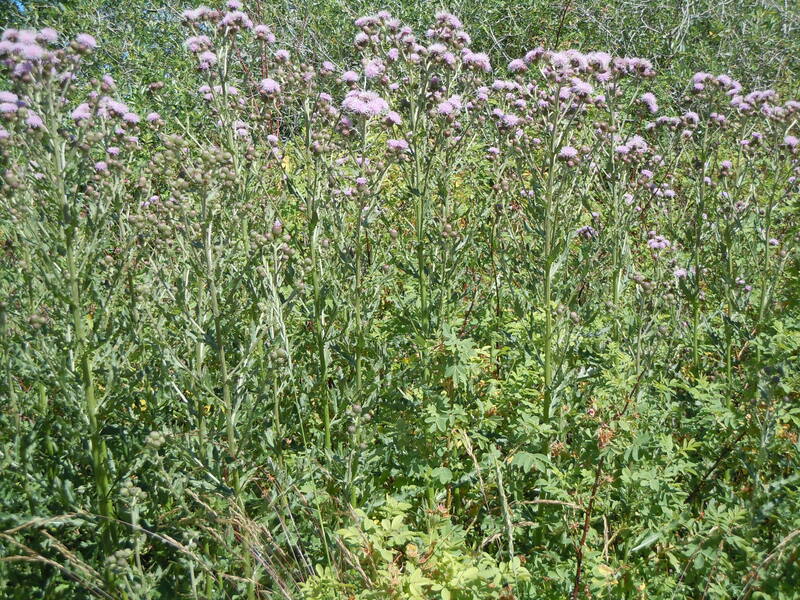 Listed as a noxious weed in a number of states but not in New York (USDA 2006). Listed as invasive by the Nature Conservancy (Nuzzo 2000).